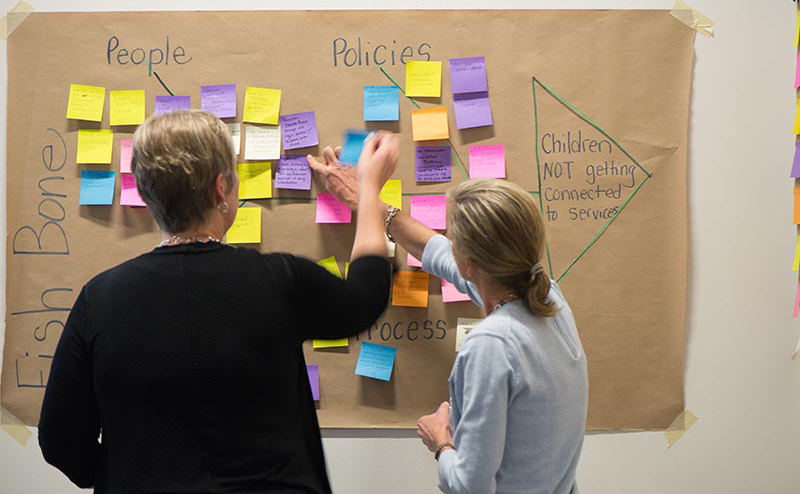 StriveTogether’s experiences with continuous improvement methods form a baseline to build on as communities test new ways of applying improvement in the education field. Collective impact has been one of the biggest buzzwords in the social sector, and, unfortunately, the term gets used for a range of activities that deviate from the original intent: achieving results at scale. Our focus with the StriveTogether Cradle to Career Network has been to establish standards for what this work really takes to achieve its true purpose. We have tried to clarify how it differs from collaboration, but that has not been enough as this beautiful concept continues to get watered down. In order to show the true power of collective impact, we are investing in a core group of communities to become demonstration sites or “Proof Points.” One of our key insights thus far from this work is that communities need to create a culture and build the capability to use data not just to prove what works, but to improve how they support children each and every day. There is an entire field built around this practice known as continuous improvement. Most of the lessons and insight are based on all that has been learned from its application in the private sector. Fortunately, the health sector has been working over the last 20 years to help use the science in hospitals, giving us key insights into how continuous improvement can apply in the social sector in general. We are currently on the cutting edge of understanding how this work can best work in the education sector and across community partners, and we want to capture these lessons and share them rapidly to help raise the bar on quality from the start and avoid the propagation of yet another buzzword in our sector. Back in 2008 when the flagship cradle-to-career partnership was launched in Cincinnati and Northern Kentucky, we worked with GE Aviation to apply one continuous improvement method — Six Sigma — to help partners use data to improve outcomes at scale. We had some significant failing forward experiences that inform our work now with the Network and can inform the field as a whole. These form a baseline of knowledge we have been building on significantly as communities including Dallas, Memphis and Spartanburg continue to test new ways of applying improvement in the field. Continuous improvement is not a technical tool but an adaptive process. In the work to apply Six Sigma in Cincinnati and Northern Kentucky, we became overly focused on the process and related tools. We provided traditional classroom lectures and over 100 pages of technical documents. This masked the true challenge of improvement: dealing with the changes in behavior those engaged in the process must consider as they learn more about what does and does not work for those they serve. So using a more simplified process — like the Plan, Do, Study, Act cycle — and applying it in real time to a real-world project is a much more effective way to learn. The team doing improvement work matters … a lot! We were often happy just to get participants from different systems to show up at meetings. We did not care who it was or how often they came. We just wanted the institutions represented. It is impossible to make progress with an ever-changing cast of characters. Instead, it is critical to map out exactly who needs to be involved and to make sure they stay consistently engaged based on the role they play. Leaders need to be visible champions and practitioners need to be working to interpret data at least every other week. Without this level of clarity, the significant time invested won’t lead to any significant change. New roles and capability are needed to embed and sustain the work in communities. Given the complexity of managing the change process and engaging the right people in the right roles, it is critical to invest in having new roles and building partner skills and capability. Having continuous improvement coaches work arm-in-arm with practitioners to help them gather, analyze and (most importantly) apply learning to their everyday work is simply critical. Simultaneously investing in training to build the capability of partners to model improvement in their organizations, is fundamentally critical to embedding the work in the community long term. This is only scratching the surface of the lessons StriveTogether is learning to make sure communities not only realize the potential of collective impact, but bring the rigor required to the practice of continuous improvement right from the start. If we focus on quality, we can achieve better results for children and communities — and embed a critical body of work in our everyday practice to improve outcomes for kids … not just create another buzzword.